This is the don’t miss event for Legionnaires in Virginia. 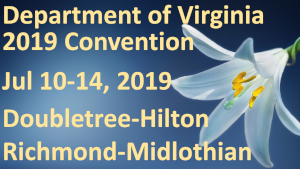 We hope to have you join us at the Department of Virginia 2019 Convention for lots of fun and valuable information. Come network with other Legionnaires and learn more about The American Legion and the Department of Virginia. This is an exciting and jam packed event with Meetings, Awards Ceremonies, Job Fair, Medical Screening, DMV Services, Blood Drive, Service Officer Assistance, and special events. The 2019 Department Convention will be held July 10-14 in Richmond, VA at the Double Tree Richmond-Midlothian Hotel and Conference Center. IMPORTANT NOTE: Your Hotel Reservation and Convention Reservation are separate actions. The Convention Committee cannot make your hotel reservations and you must do this on your own through the hotel. Hotel Reservations – Navigate to the special hotel website by clicking HERE to book your room reservation by credit card online. If you encounter difficulties you can also call 1-800-HILTONS. Before calling please make sure you have your credit card ready and advise them you want to make a reservation at the DoubleTree by Hilton Hotel Richmond-Midlotian for the American Legion Convention and your Group Code is AMS. Room Rate: $109.00 per night (verify rate when booking). Book by June 21st to make sure you can get a room. Convention Registration – Registration has started and you can click HERE to get the Adobe fillable form. Event information and schedules are not quite ready. Just as soon as the information is available it will be posted here. Convention Golf Tournament – Download the flyer and registration form for the event HERE. The tournament will be held on Thursday, July 11th, 2019 – 10:00 AM. Reservation Deadline – Jul 5th, 2019.